2015 Mercedes CLA Shooting Brake - engines, specification and release date | What Car? The new Mercedes-Benz CLA Shooting Brake has been revealed at the Detroit motor show before it goes on sale in March 2015. The CLA Shooting Brake is the final new body style to be based on the company's front-drive platform, and goes on sale in the UK in March 2015. The compact four-door estate’s dramatic styling follows closely in the mould of the larger CLS Shooting Brake and puts greater emphasis on style than outright carrying capacity. The luggage space of the 4.6m-long Shooting Brake improves on that of the CLA saloon by 35 litres, at 495 litres, rising to 1354 litres with the rear seats folded. This new model arguably gives Mercedes a handy advantage over its rivals, because neither the Audi A3 nor the BMW 1 Series offers anything similar. At launch, the CLA Shooting Brake's engine line-up consists of two diesels and four petrols. The most efficient option in the launch line-up, the CLA200 CDI, returns up to 72.4mpg with CO2 emissions of 101g/km. Another two diesel engines – the CLA200 CDI 4Matic and CLA220 CDI 4Matic – arrive in September 2015. The four-wheel-drive CLA250 4Matic model will be offered only in Engineered by AMG spec. A new CLA45 AMG Shooting Brake, powered by a 2.0-litre four-cylinder turbocharged engine developing 355bhp and 332lb ft, has also been revealed. The engine is described by Mercedes as being the most powerful four-cylinder unit in series production. 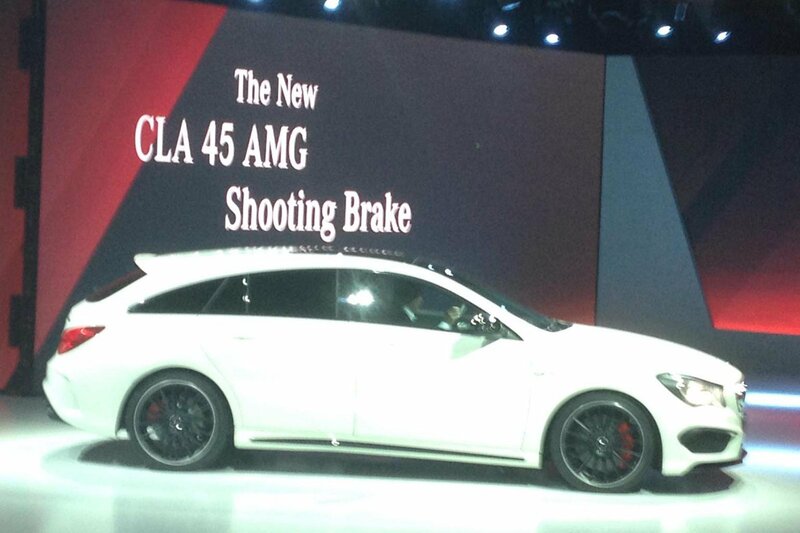 The CLA45 AMG Shooting Brake gets to 62mph in 4.7 seconds, and has a limited top speed of 155mph. The model will make its debut at the Geneva motor show in March, with UK sales due to start at the same time. The estate version of the CLA will be closely aligned to the saloon, with specification set to be similar to the four-door model. There are four trim levels: Sport, AMG Sport, Engineered by AMG, and AMG. In addition, there is a special-edition model called Orange Art. Sport comes with auto lights and wipers, 18-inch alloys, climate and cruise controls, rear parking sensors, four electric windows, Bluetooth and a USB socket. AMG Sport adds stiffer suspension, AMG body styling, tinted glass and sports seats. The biggest differences in standard specification and available options over the saloon will be that the Shooting Brake gets an electric tailgate as standard and the option of a load compartment package, which includes a lockable boot floor and aluminium load rails. Final prices have not yet been revealed, but are expected to start at around £25,500 and rise to just over £43,000 for the CLA45 AMG. Our Target Price team reckons you can get discounts through the dealer from around £1300 and £2500 on the saloon version of the CLA. There is every chance that the Shooting Brake will follow on a similar line once it has launched, even if discounts are not immediately available.